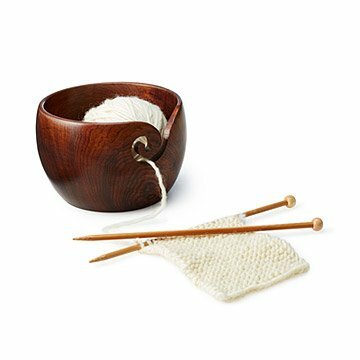 Handcrafted from sheesham wood, this bowl holds balls of yarn with sturdy sophistication. Handcrafted from richly grained sheesham wood, this bowl keeps balls of yarn in place with sturdy sophistication. The hooked notch in the side allows yarn to unfurl neatly to keep your crafting under control. Handmade by cooperatives of artisans in India, it makes a lovely and functional gift for your favorite crafter or any of your close-knits. I gave this to my mother for her birthday. She frequently knits and has found this bowl to be quite useful as well as beautiful. Put a ball of yarn in the bowl, thread it through the curlicue for continuous untangled feed of yarn. I love this product, and I love that is made from wood. I've had ceramic ones that would end up broken:( I keep it on my coffee table as it is a piece of art!! Seems perfect for my knitter friend! This is a gift. Chose wood over ceramic for permanence. I was delighted with the gift, the store wrapping and timely delivery. My mom absolutely loved this gift. She loves to crochet, but her cat always tries to eat the yearn, so this was perfect for keeping the yarn out of his reach. This is the third gift I have given her from this site, and she loves each one more and more. My mother is an avid knitter, and she loves the weight and smoothness of this bowl. The yarn glides out easily, and it looks like a piece of art.